Download "VIP Video Converter User Guide"
5 User Guide 4 Overview is one of the leading video converters on the market. It s rich in useful and easy to use features. Here we present you a short summary of them: Converts any video / audio file to more than 170 video / audio formats, and more than 220 devices. Includes batch conversion support. Allows previewing the output video file while converting. Allows adjusting video & audio properties such as: codec, frame rate, bit rate, video starting time, duration, Sampling rate, size, audio channels, volume and more (Includes pre-defined settings as well). Supports various Windows systems, including XP, Vista, Windows 7 & more. Allows splitting the converted video / audio file by a specific size. Allows merging few video files, to one combined converted video / audio file. Supports audio track extractions, from video files. Supports drag and drop to add video / audio files Easy to use with a friendly user interface, which will fits both beginners and professionals. Comes with help files, FAQ, online help and live chat support. High converting speed and superb output video & audio quality. And the price, as low as it can get, to keep us working on improving VIP Video Converter for our clients. 6 User Guide 5 Supported Formats supports more than 170 video and audio formats, both as input and output formats. Here, we listed the most common ones, which you might wish to use in your daily conversion operations. Supported Video Formats AVI, MP4, VCD, SVCD (PAL/NTSC), DiVX, WMV, FLV, DVD (PAL/NTSC), MPEG-1, MPEG- 2, MP4, 3GP, 3GPP2, MOV, SWF, H.263, H.264, MPG, VOB, RM, RMVB, DV, ASF, XViD, HD Video Formats (AVI HD, MP4 HD etc.). Supported Audio Formats MP3, WMA, OGG, WAV, AAC, AC3, MP2, AIFF, FLAC, AU, AMR, RA Supported Physical Devices Various Cellphones, ipod, iphone, BlackBerry, iriver, Zenvision, Xbox, PlayStation 3, PSP, Motorola (CLIQ/DROID), Zune, ipad, AppleTV, Archos, Android, Wii, NexusOne, HTC (G2, Hero, Tattoo), Samsung i7500, HD Video Formats for these devices. 8 User Guide 7 Main Window - Upper Toolbar The upper toolbar of the main window contains three tabs which you can switch between, and choose the output video formats you wish to convert to. These formats can be video formats, audio formats, or physical device (such as iphone) formats. 1. 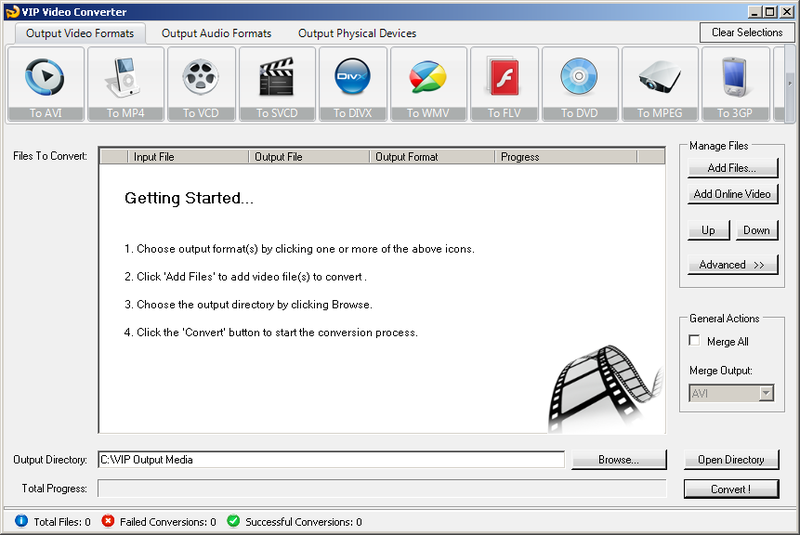 Output Video Formats This tab shows all the available output video formats such as AVI, MP4, FLV, WMV, 3GP etc. 2. Output Audio Formats This tab shows all the available output audio formats such as MP3, AAC, AC3, WMA, OGG etc. 3. 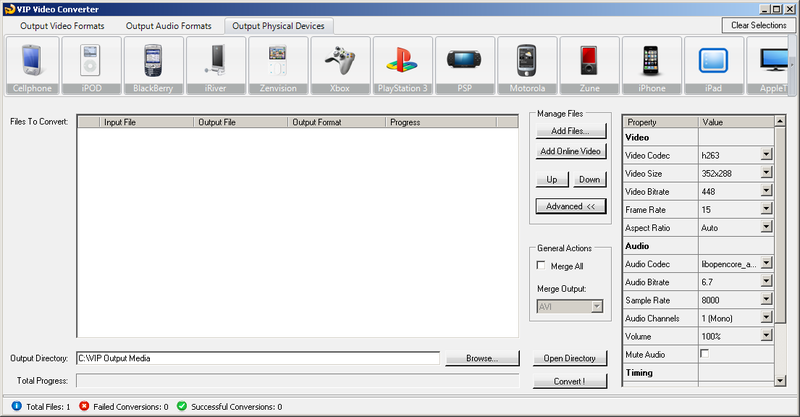 Output Physical Devices This tab shows all the supported physical devices which you can convert your video files to such as iphone, ipod, Samsung Galaxy, Blackberry, PlayStation 3, Xbox etc. This toolbar also includes a Clean Selections button at the top right corner of the window. When clicked, this button will clear all the output format selections, to get you started from blank (as if you just now started the software again and didn t choose formats for conversion yet). Main Window - Right Toolbar The first section in this toolbar is the Manage Files section, which allows you to add, arrange and modify properties of files which are added for conversion. These are the tasks you can perform by using the buttons in this toolbar: 1. Add Files Add new files for conversion. These files can be almost any video or audio files you can think of, which are supported as input files in VIP Video Converter. Adding files via this action will add them to the main table at the middle of the main window. 2. Up / Down Navigation buttons which allow you to set the order of conversions. Moving up a file in the table of files to convert means to set it earlier for conversion. 9 User Guide 8 3. Advanced This button opens a hidden part of the window, which allows you to set custom and advanced settings for your video conversion. Properties such as video size, frame rate, bit rate, video and audio codecs, splitting options, timing options and more. The second section in the right toolbar is General Actions : 1. Merge All This checkbox allows you to merge all the converted video files to one video file. Once this checkbox is checked, you can choose the Merge Output. 2. Merge Output The video / audio format of the merged file. This is the format all the converted files will be merged to. Main Window Bottom Toolbar The bottom toolbar is responsible of the conversions output directory, the progress report, and the most important button: Convert. These are the tasks which can be performed by using this toolbar: 1. Output Directory Browse Use this option to choose the output directory where your converted video and audio files will be saved to. 2. Open Directory Allows you to directly open the output directory in order to fetch and watch the converted video / audio files. 3. Convert This button starts the conversion of the video / audio files. Once clicked, it will turn to a Cancel button which will allow you to cancel the conversion while it s running. 10 User Guide 9 Main Window Status Bar The status bar at the bottom of the form shows how many files were converted. As well, it shows how many of them were converted successfully, and how many of them failed during conversion. 11 User Guide 10 Common Screen Captures The main form of the software. The main window s extended form, which contains the right toolbar of the advanced properties. 12 User Guide 11 A demonstration of previewing a video file while converting. A view of the original file s properties. These are the properties of the file which was chosen for conversion. 13 User Guide 12 A demonstration of conversion of few video files to other video formats. A demonstration of a conversion of a video file to an audio format. 14 User Guide 13 A demonstration of a conversion of a video file to a physical device. 15 User Guide 14 Converting Files Converting To Video Formats Dozens of video file formats are supported both for input and output in VIP Video Converter. The supported file formats include: AVI, MP4, VCD, SVCD (PAL/NTSC), DiVX, WMV, FLV, DVD (PAL/NTSC), MPEG-1, MPEG-2, MP4, 3GP, 3GPP2, MOV, SWF, H.263, H.264, MPG, VOB, RM, RMVB, DV, ASF, XViD, HD Video Formats (AVI HD, MP4 HD etc.). Converting To AVI Format In order to convert your video file to AVI video format, follow these steps: 1. Press the To AVI button at the top formats menu. If there is a choice of a specific format, please choose one (in example, AVI or AVI HD). The output format you ve chosen should be now marked in yellow. 16 User Guide Click the Add Files button at the right pane, and choose file(s) for conversion. 3. At the bottom right, click the Browse button to choose the output directory. This will be the directory where the converted files will be written to. 4. If you wish to set custom (advanced) settings, click the Advanced >> button to open the right advanced properties pane. In the right advanced properties pane you can modify some of the following properties, which will affect the conversion process: Video Properties o Video Codec The video codec which will be used to convert the video file. You can choose from variety of codecs which are supported for your chosen output video format. More information about video codecs at Wikipedia In case you aren t sure which codec to use, you can choose the Auto option. 17 User Guide 16 o Video Size You can specify a custom size for the output video file (width and height). You can choose the Auto option if you do not know which video size you wish to get, or if you would like to try and output the video file at the same size as the original video file. o Video Bitrate The higher the bit rate will be, the higher the video quality will be at the result video file. Increasing it will also result in an increased file size and higher conversion time. o Frame Rate Frames which will be shown per second. Increasing it will also result in an increased file size and higher conversion time. o Aspect Ratio The ratio between width and height. Common values are 16:9 or 4:3. The Auto option can be selected when the original aspect ratio is to be kept. Audio Properties o Audio Codec - The audio codec which will be used to convert the audio layer of the video file. You can choose from variety of codecs which are supported for your chosen output format. More information about audio codecs at Wikipedia. In case you aren t sure which codec to use, you can choose the Auto option. o Audio Bitrate - The higher the bit rate will be, the higher the audio quality will be at the result video file. Increasing it will also result in an increased file size and higher conversion time. o Sample Rate Amount of samples used to create an audio signal. Increasing it will also result in an increased file size and higher conversion time. o Audio Channels The number of audio channels used for the audio layer. Common values are 1 channel (mono), 2 channels (stereo), or 5.1 (6 channels). o Volume Set the percentage of the audio volume which will be available at the converted video file. This is relative to the original video file. o Mute Audio This option allows you to mute the audio in the converted video file. 18 User Guide 17 Timing o Starting Time This option allows you to start the conversion at a specific location (time) in the video file, and not from the beginning. o Duration This option allows you to specify a specific duration from the video file which will be converted. This option actually also acts as an end time, when combined with the Starting Time option. In example, you can specify the Starting Time as 00:01:00, and duration as 00:04:00 to convert 4 minutes, starting from the first minute of the video file. Special o Split This feature allows you to split the video file to equal sized chunks of video. This is used commonly used to squeeze video files into media such as floppies, CD, DVD and more. 5. Now, click the Convert! button to start the conversion. 6. While the files are converted, you can preview the output video file by clicking the red icon at the right part of each conversion line. 7. Once the conversion is done, the converted video files will be at the output directory you specified at step 3. You can open that directory by clicking the Open Directory button at the bottom pane. 19 User Guide 18 Converting To MP4 Format In order to convert your video file to MP4 video format, follow these steps: 1. Press the To MP4 button at the top formats menu. If there is a choice of a specific format, please choose one (in example, MP4 or MP4 HD). The output format you ve chosen should be now marked in yellow. 2. Click the Add Files button at the right pane, and choose file(s) for conversion. 3. At the bottom right, click the Browse button to choose the output directory. This will be the directory where the converted files will be written to. 4. If you wish to set custom (advanced) settings, click the Advanced >> button to open the right advanced properties pane. 20 User Guide 19 In the right advanced properties pane you can modify some of the following properties, which will affect the conversion process: Video Properties o Video Codec The video codec which will be used to convert the video file. You can choose from variety of codecs which are supported for your chosen output video format. More information about video codecs at Wikipedia In case you aren t sure which codec to use, you can choose the Auto option. 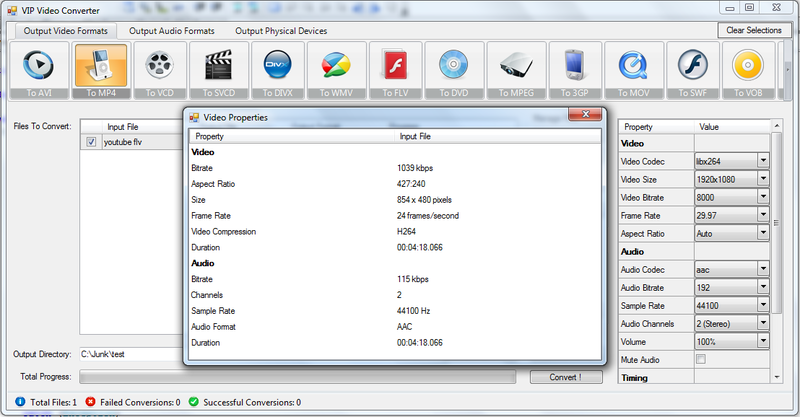 o Video Size You can specify a custom size for the output video file (width and height). You can choose the Auto option if you do not know which video size you wish to get, or if you would like to try and output the video file at the same size as the original video file. o Video Bitrate The higher the bit rate will be, the higher the video quality will be at the result video file. Increasing it will also result in an increased file size and higher conversion time. 22 User Guide 21 can specify the Starting Time as 00:01:00, and duration as 00:04:00 to convert 4 minutes, starting from the first minute of the video file. Special o Split This feature allows you to split the video file to equal sized chunks of video. This is used commonly used to squeeze video files into media such as floppies, CD, DVD and more. 5. Now, click the Convert! button to start the conversion. 6. While the files are converted, you can preview the output video file by clicking the red icon at the right part of each conversion line. Once the conversion is done, the converted video files will be at the output directory you specified at step 3. You can open that directory by clicking the Open Directory button at the bottom pane. 23 User Guide 22 Converting To VCD Format In order to convert your video file to VCD video format, follow these steps: 1. Press the To VCD button at the top formats menu. If there is a choice of a specific format, please choose one (in example, VCD or VCD HD). The output format you ve chosen should be now marked in yellow. 2. Click the Add Files button at the right pane, and choose file(s) for conversion. 3. At the bottom right, click the Browse button to choose the output directory. This will be the directory where the converted files will be written to. 4. If you wish to set custom (advanced) settings, click the Advanced >> button to open the right advanced properties pane. 24 User Guide 23 In the right advanced properties pane you can modify some of the following properties, which will affect the conversion process: Video Properties o Video Codec The video codec which will be used to convert the video file. You can choose from variety of codecs which are supported for your chosen output video format. More information about video codecs at Wikipedia In case you aren t sure which codec to use, you can choose the Auto option. o Video Size You can specify a custom size for the output video file (width and height). You can choose the Auto option if you do not know which video size you wish to get, or if you would like to try and output the video file at the same size as the original video file. o Video Bitrate The higher the bit rate will be, the higher the video quality will be at the result video file. Increasing it will also result in an increased file size and higher conversion time. 26 User Guide 25 can specify the Starting Time as 00:01:00, and duration as 00:04:00 to convert 4 minutes, starting from the first minute of the video file. Special o Split This feature allows you to split the video file to equal sized chunks of video. This is used commonly used to squeeze video files into media such as floppies, CD, DVD and more. 5. Now, click the Convert! button to start the conversion. 6. While the files are converted, you can preview the output video file by clicking the red icon at the right part of each conversion line. Once the conversion is done, the converted video files will be at the output directory you specified at step 3. You can open that directory by clicking the Open Directory button at the bottom pane. 27 User Guide 26 Converting To DIVX Format In order to convert your video file to DIVX video format, follow these steps: 1. Press the To DIVX button at the top formats menu. If there is a choice of a specific format, please choose one (in example, DIVX or DIVX HD). The output format you ve chosen should be now marked in yellow. 2. Click the Add Files button at the right pane, and choose file(s) for conversion. 3. At the bottom right, click the Browse button to choose the output directory. This will be the directory where the converted files will be written to. 4. If you wish to set custom (advanced) settings, click the Advanced >> button to open the right advanced properties pane. 28 User Guide 27 In the right advanced properties pane you can modify some of the following properties, which will affect the conversion process: Video Properties o Video Codec The video codec which will be used to convert the video file. You can choose from variety of codecs which are supported for your chosen output video format. More information about video codecs at Wikipedia In case you aren t sure which codec to use, you can choose the Auto option. o Video Size You can specify a custom size for the output video file (width and height). You can choose the Auto option if you do not know which video size you wish to get, or if you would like to try and output the video file at the same size as the original video file. o Video Bitrate The higher the bit rate will be, the higher the video quality will be at the result video file. Increasing it will also result in an increased file size and higher conversion time. 30 User Guide 29 can specify the Starting Time as 00:01:00, and duration as 00:04:00 to convert 4 minutes, starting from the first minute of the video file. Special o Split This feature allows you to split the video file to equal sized chunks of video. This is used commonly used to squeeze video files into media such as floppies, CD, DVD and more. 5. Now, click the Convert! button to start the conversion. 6. While the files are converted, you can preview the output video file by clicking the red icon at the right part of each conversion line. Once the conversion is done, the converted video files will be at the output directory you specified at step 3. You can open that directory by clicking the Open Directory button at the bottom pane. 31 User Guide 30 Converting To WMV Format In order to convert your video file to WMV video format, follow these steps: 1. Press the To WMV button at the top formats menu. If there is a choice of a specific format, please choose one (in example, WMV or WMV HD). The output format you ve chosen should be now marked in yellow. 2. Click the Add Files button at the right pane, and choose file(s) for conversion. 3. At the bottom right, click the Browse button to choose the output directory. This will be the directory where the converted files will be written to. 4. If you wish to set custom (advanced) settings, click the Advanced >> button to open the right advanced properties pane. 32 User Guide 31 In the right advanced properties pane you can modify some of the following properties, which will affect the conversion process: Video Properties o Video Codec The video codec which will be used to convert the video file. You can choose from variety of codecs which are supported for your chosen output video format. More information about video codecs at Wikipedia In case you aren t sure which codec to use, you can choose the Auto option. o Video Size You can specify a custom size for the output video file (width and height). You can choose the Auto option if you do not know which video size you wish to get, or if you would like to try and output the video file at the same size as the original video file. o Video Bitrate The higher the bit rate will be, the higher the video quality will be at the result video file. Increasing it will also result in an increased file size and higher conversion time. 34 User Guide 33 can specify the Starting Time as 00:01:00, and duration as 00:04:00 to convert 4 minutes, starting from the first minute of the video file. Special o Split This feature allows you to split the video file to equal sized chunks of video. This is used commonly used to squeeze video files into media such as floppies, CD, DVD and more. 5. Now, click the Convert! button to start the conversion. 6. While the files are converted, you can preview the output video file by clicking the red icon at the right part of each conversion line. Once the conversion is done, the converted video files will be at the output directory you specified at step 3. You can open that directory by clicking the Open Directory button at the bottom pane. 35 User Guide 34 Converting To FLV Format In order to convert your video file to FLV video format, follow these steps: 1. Press the To FLV button at the top formats menu. If there is a choice of a specific format, please choose one (in example, FLV or FLV HD). The output format you ve chosen should be now marked in yellow. 2. Click the Add Files button at the right pane, and choose file(s) for conversion. 3. At the bottom right, click the Browse button to choose the output directory. This will be the directory where the converted files will be written to. 4. If you wish to set custom (advanced) settings, click the Advanced >> button to open the right advanced properties pane. 36 User Guide 35 In the right advanced properties pane you can modify some of the following properties, which will affect the conversion process: Video Properties o Video Codec The video codec which will be used to convert the video file. You can choose from variety of codecs which are supported for your chosen output video format. More information about video codecs at Wikipedia In case you aren t sure which codec to use, you can choose the Auto option. o Video Size You can specify a custom size for the output video file (width and height). You can choose the Auto option if you do not know which video size you wish to get, or if you would like to try and output the video file at the same size as the original video file. o Video Bitrate The higher the bit rate will be, the higher the video quality will be at the result video file. Increasing it will also result in an increased file size and higher conversion time. 38 User Guide 37 can specify the Starting Time as 00:01:00, and duration as 00:04:00 to convert 4 minutes, starting from the first minute of the video file. Special o Split This feature allows you to split the video file to equal sized chunks of video. This is used commonly used to squeeze video files into media such as floppies, CD, DVD and more. 5. Now, click the Convert! button to start the conversion. 6. While the files are converted, you can preview the output video file by clicking the red icon at the right part of each conversion line. Once the conversion is done, the converted video files will be at the output directory you specified at step 3. You can open that directory by clicking the Open Directory button at the bottom pane. 39 User Guide 38 Converting To DVD Format In order to convert your video file to DVD video format, follow these steps: 1. Press the To DVD button at the top formats menu. If there is a choice of a specific format, please choose one (in example, DVD or DVD HD). The output format you ve chosen should be now marked in yellow. 2. Click the Add Files button at the right pane, and choose file(s) for conversion. 3. At the bottom right, click the Browse button to choose the output directory. This will be the directory where the converted files will be written to. 4. If you wish to set custom (advanced) settings, click the Advanced >> button to open the right advanced properties pane. 40 User Guide 39 In the right advanced properties pane you can modify some of the following properties, which will affect the conversion process: Video Properties o Video Codec The video codec which will be used to convert the video file. You can choose from variety of codecs which are supported for your chosen output video format. More information about video codecs at Wikipedia In case you aren t sure which codec to use, you can choose the Auto option. o Video Size You can specify a custom size for the output video file (width and height). You can choose the Auto option if you do not know which video size you wish to get, or if you would like to try and output the video file at the same size as the original video file. o Video Bitrate The higher the bit rate will be, the higher the video quality will be at the result video file. Increasing it will also result in an increased file size and higher conversion time. 42 User Guide 41 can specify the Starting Time as 00:01:00, and duration as 00:04:00 to convert 4 minutes, starting from the first minute of the video file. Special o Split This feature allows you to split the video file to equal sized chunks of video. This is used commonly used to squeeze video files into media such as floppies, CD, DVD and more. 5. Now, click the Convert! button to start the conversion. 6. While the files are converted, you can preview the output video file by clicking the red icon at the right part of each conversion line. Once the conversion is done, the converted video files will be at the output directory you specified at step 3. You can open that directory by clicking the Open Directory button at the bottom pane. 43 User Guide 42 Converting To MPEG-1 Format In order to convert your video file to MPEG-1 video format, follow these steps: 1. Press the To MPEG-1 button at the top formats menu. If there is a choice of a specific format, please choose one (in example, MPEG-1 or MPEG-1 HD). The output format you ve chosen should be now marked in yellow. 2. Click the Add Files button at the right pane, and choose file(s) for conversion. 3. At the bottom right, click the Browse button to choose the output directory. This will be the directory where the converted files will be written to. 4. If you wish to set custom (advanced) settings, click the Advanced >> button to open the right advanced properties pane. 44 User Guide 43 In the right advanced properties pane you can modify some of the following properties, which will affect the conversion process: Video Properties o Video Codec The video codec which will be used to convert the video file. You can choose from variety of codecs which are supported for your chosen output video format. More information about video codecs at Wikipedia In case you aren t sure which codec to use, you can choose the Auto option. o Video Size You can specify a custom size for the output video file (width and height). You can choose the Auto option if you do not know which video size you wish to get, or if you would like to try and output the video file at the same size as the original video file. o Video Bitrate The higher the bit rate will be, the higher the video quality will be at the result video file. Increasing it will also result in an increased file size and higher conversion time. 46 User Guide 45 can specify the Starting Time as 00:01:00, and duration as 00:04:00 to convert 4 minutes, starting from the first minute of the video file. Special o Split This feature allows you to split the video file to equal sized chunks of video. This is used commonly used to squeeze video files into media such as floppies, CD, MPEG-1 and more. 5. Now, click the Convert! button to start the conversion. 6. While the files are converted, you can preview the output video file by clicking the red icon at the right part of each conversion line. Once the conversion is done, the converted video files will be at the output directory you specified at step 3. You can open that directory by clicking the Open Directory button at the bottom pane. 47 User Guide 46 Converting To MPEG-2 Format In order to convert your video file to MPEG-2 video format, follow these steps: 1. Press the To MPEG-2 button at the top formats menu. If there is a choice of a specific format, please choose one (in example, MPEG-2 or MPEG-2 HD). The output format you ve chosen should be now marked in yellow. 2. Click the Add Files button at the right pane, and choose file(s) for conversion. 3. At the bottom right, click the Browse button to choose the output directory. This will be the directory where the converted files will be written to. 4. If you wish to set custom (advanced) settings, click the Advanced >> button to open the right advanced properties pane. 48 User Guide 47 In the right advanced properties pane you can modify some of the following properties, which will affect the conversion process: Video Properties o Video Codec The video codec which will be used to convert the video file. You can choose from variety of codecs which are supported for your chosen output video format. More information about video codecs at Wikipedia In case you aren t sure which codec to use, you can choose the Auto option. o Video Size You can specify a custom size for the output video file (width and height). You can choose the Auto option if you do not know which video size you wish to get, or if you would like to try and output the video file at the same size as the original video file. o Video Bitrate The higher the bit rate will be, the higher the video quality will be at the result video file. Increasing it will also result in an increased file size and higher conversion time. 50 User Guide 49 can specify the Starting Time as 00:01:00, and duration as 00:04:00 to convert 4 minutes, starting from the first minute of the video file. Special o Split This feature allows you to split the video file to equal sized chunks of video. This is used commonly used to squeeze video files into media such as floppies, CD, MPEG-2 and more. 5. Now, click the Convert! button to start the conversion. 6. While the files are converted, you can preview the output video file by clicking the red icon at the right part of each conversion line. Once the conversion is done, the converted video files will be at the output directory you specified at step 3. You can open that directory by clicking the Open Directory button at the bottom pane. 51 User Guide 50 Converting To 3GP Format In order to convert your video file to 3GP video format, follow these steps: 1. Press the To 3GP button at the top formats menu. If there is a choice of a specific format, please choose one (in example, 3GP or 3GP HD). The output format you ve chosen should be now marked in yellow. 2. Click the Add Files button at the right pane, and choose file(s) for conversion. 3. At the bottom right, click the Browse button to choose the output directory. This will be the directory where the converted files will be written to. 4. If you wish to set custom (advanced) settings, click the Advanced >> button to open the right advanced properties pane. 52 User Guide 51 In the right advanced properties pane you can modify some of the following properties, which will affect the conversion process: Video Properties o Video Codec The video codec which will be used to convert the video file. You can choose from variety of codecs which are supported for your chosen output video format. More information about video codecs at Wikipedia In case you aren t sure which codec to use, you can choose the Auto option. o Video Size You can specify a custom size for the output video file (width and height). You can choose the Auto option if you do not know which video size you wish to get, or if you would like to try and output the video file at the same size as the original video file. o Video Bitrate The higher the bit rate will be, the higher the video quality will be at the result video file. Increasing it will also result in an increased file size and higher conversion time. 54 User Guide 53 can specify the Starting Time as 00:01:00, and duration as 00:04:00 to convert 4 minutes, starting from the first minute of the video file. Special o Split This feature allows you to split the video file to equal sized chunks of video. This is used commonly used to squeeze video files into media such as floppies, CD, 3GP and more. 5. Now, click the Convert! button to start the conversion. 6. While the files are converted, you can preview the output video file by clicking the red icon at the right part of each conversion line. Once the conversion is done, the converted video files will be at the output directory you specified at step 3. You can open that directory by clicking the Open Directory button at the bottom pane. 55 User Guide 54 Converting To 3GPP2 Format In order to convert your video file to 3GPP2 video format, follow these steps: 1. Press the To 3GPP2 button at the top formats menu. If there is a choice of a specific format, please choose one (in example, 3GPP2 or 3GPP2 HD). The output format you ve chosen should be now marked in yellow. 2. Click the Add Files button at the right pane, and choose file(s) for conversion. 3. At the bottom right, click the Browse button to choose the output directory. This will be the directory where the converted files will be written to. 4. If you wish to set custom (advanced) settings, click the Advanced >> button to open the right advanced properties pane. 56 User Guide 55 In the right advanced properties pane you can modify some of the following properties, which will affect the conversion process: Video Properties o Video Codec The video codec which will be used to convert the video file. You can choose from variety of codecs which are supported for your chosen output video format. More information about video codecs at Wikipedia In case you aren t sure which codec to use, you can choose the Auto option. o Video Size You can specify a custom size for the output video file (width and height). You can choose the Auto option if you do not know which video size you wish to get, or if you would like to try and output the video file at the same size as the original video file. o Video Bitrate The higher the bit rate will be, the higher the video quality will be at the result video file. Increasing it will also result in an increased file size and higher conversion time. 58 User Guide 57 can specify the Starting Time as 00:01:00, and duration as 00:04:00 to convert 4 minutes, starting from the first minute of the video file. Special o Split This feature allows you to split the video file to equal sized chunks of video. This is used commonly used to squeeze video files into media such as floppies, CD, 3GPP2 and more. 5. Now, click the Convert! button to start the conversion. 6. While the files are converted, you can preview the output video file by clicking the red icon at the right part of each conversion line. Once the conversion is done, the converted video files will be at the output directory you specified at step 3. You can open that directory by clicking the Open Directory button at the bottom pane. 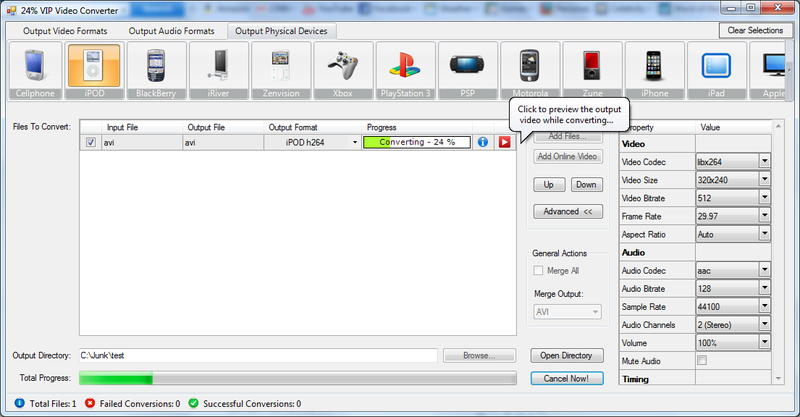 59 User Guide 58 Converting To MOV Format In order to convert your video file to MOV video format, follow these steps: 1. Press the To MOV button at the top formats menu. If there is a choice of a specific format, please choose one (in example, MOV or MOV HD). The output format you ve chosen should be now marked in yellow. 2. Click the Add Files button at the right pane, and choose file(s) for conversion. 3. At the bottom right, click the Browse button to choose the output directory. This will be the directory where the converted files will be written to. 4. If you wish to set custom (advanced) settings, click the Advanced >> button to open the right advanced properties pane. 60 User Guide 59 In the right advanced properties pane you can modify some of the following properties, which will affect the conversion process: Video Properties o Video Codec The video codec which will be used to convert the video file. You can choose from variety of codecs which are supported for your chosen output video format. More information about video codecs at Wikipedia In case you aren t sure which codec to use, you can choose the Auto option. o Video Size You can specify a custom size for the output video file (width and height). You can choose the Auto option if you do not know which video size you wish to get, or if you would like to try and output the video file at the same size as the original video file. o Video Bitrate The higher the bit rate will be, the higher the video quality will be at the result video file. Increasing it will also result in an increased file size and higher conversion time. 62 User Guide 61 can specify the Starting Time as 00:01:00, and duration as 00:04:00 to convert 4 minutes, starting from the first minute of the video file. Special o Split This feature allows you to split the video file to equal sized chunks of video. This is used commonly used to squeeze video files into media such as floppies, CD, MOV and more. 5. Now, click the Convert! button to start the conversion. 6. While the files are converted, you can preview the output video file by clicking the red icon at the right part of each conversion line. Once the conversion is done, the converted video files will be at the output directory you specified at step 3. You can open that directory by clicking the Open Directory button at the bottom pane. 63 User Guide 62 Converting To SWF Format In order to convert your video file to SWF video format, follow these steps: 1. Press the To SWF button at the top formats menu. If there is a choice of a specific format, please choose one (in example, SWF or SWF HD). The output format you ve chosen should be now marked in yellow. 2. Click the Add Files button at the right pane, and choose file(s) for conversion. 3. At the bottom right, click the Browse button to choose the output directory. This will be the directory where the converted files will be written to. 4. If you wish to set custom (advanced) settings, click the Advanced >> button to open the right advanced properties pane. 64 User Guide 63 In the right advanced properties pane you can modify some of the following properties, which will affect the conversion process: Video Properties o Video Codec The video codec which will be used to convert the video file. You can choose from variety of codecs which are supported for your chosen output video format. More information about video codecs at Wikipedia In case you aren t sure which codec to use, you can choose the Auto option. o Video Size You can specify a custom size for the output video file (width and height). You can choose the Auto option if you do not know which video size you wish to get, or if you would like to try and output the video file at the same size as the original video file. o Video Bitrate The higher the bit rate will be, the higher the video quality will be at the result video file. Increasing it will also result in an increased file size and higher conversion time. 66 User Guide 65 can specify the Starting Time as 00:01:00, and duration as 00:04:00 to convert 4 minutes, starting from the first minute of the video file. Special o Split This feature allows you to split the video file to equal sized chunks of video. This is used commonly used to squeeze video files into media such as floppies, CD, SWF and more. 5. Now, click the Convert! button to start the conversion. 6. While the files are converted, you can preview the output video file by clicking the red icon at the right part of each conversion line. Once the conversion is done, the converted video files will be at the output directory you specified at step 3. You can open that directory by clicking the Open Directory button at the bottom pane. 67 User Guide 66 Converting To H.264 Format In order to convert your video file to H.264 video format, follow these steps: 1. Press the To H.264 button at the top formats menu. If there is a choice of a specific format, please choose one (in example, H.264 or H.264 HD). The output format you ve chosen should be now marked in yellow. 2. Click the Add Files button at the right pane, and choose file(s) for conversion. 3. At the bottom right, click the Browse button to choose the output directory. This will be the directory where the converted files will be written to. 4. If you wish to set custom (advanced) settings, click the Advanced >> button to open the right advanced properties pane. 68 User Guide 67 In the right advanced properties pane you can modify some of the following properties, which will affect the conversion process: Video Properties o Video Codec The video codec which will be used to convert the video file. You can choose from variety of codecs which are supported for your chosen output video format. More information about video codecs at Wikipedia In case you aren t sure which codec to use, you can choose the Auto option. o Video Size You can specify a custom size for the output video file (width and height). You can choose the Auto option if you do not know which video size you wish to get, or if you would like to try and output the video file at the same size as the original video file. o Video Bitrate The higher the bit rate will be, the higher the video quality will be at the result video file. Increasing it will also result in an increased file size and higher conversion time. 70 User Guide 69 can specify the Starting Time as 00:01:00, and duration as 00:04:00 to convert 4 minutes, starting from the first minute of the video file. Special o Split This feature allows you to split the video file to equal sized chunks of video. This is used commonly used to squeeze video files into media such as floppies, CD, H.264 and more. 5. Now, click the Convert! button to start the conversion. 6. While the files are converted, you can preview the output video file by clicking the red icon at the right part of each conversion line. Once the conversion is done, the converted video files will be at the output directory you specified at step 3. You can open that directory by clicking the Open Directory button at the bottom pane. 71 User Guide 70 Converting To VOB Format In order to convert your video file to VOB video format, follow these steps: 1. Press the To VOB button at the top formats menu. If there is a choice of a specific format, please choose one (in example, VOB or VOB HD). The output format you ve chosen should be now marked in yellow. 2. Click the Add Files button at the right pane, and choose file(s) for conversion. 3. At the bottom right, click the Browse button to choose the output directory. This will be the directory where the converted files will be written to. 4. If you wish to set custom (advanced) settings, click the Advanced >> button to open the right advanced properties pane. 72 User Guide 71 In the right advanced properties pane you can modify some of the following properties, which will affect the conversion process: Video Properties o Video Codec The video codec which will be used to convert the video file. You can choose from variety of codecs which are supported for your chosen output video format. More information about video codecs at Wikipedia In case you aren t sure which codec to use, you can choose the Auto option. o Video Size You can specify a custom size for the output video file (width and height). You can choose the Auto option if you do not know which video size you wish to get, or if you would like to try and output the video file at the same size as the original video file. o Video Bitrate The higher the bit rate will be, the higher the video quality will be at the result video file. Increasing it will also result in an increased file size and higher conversion time. 74 User Guide 73 can specify the Starting Time as 00:01:00, and duration as 00:04:00 to convert 4 minutes, starting from the first minute of the video file. Special o Split This feature allows you to split the video file to equal sized chunks of video. This is used commonly used to squeeze video files into media such as floppies, CD, VOB and more. 5. Now, click the Convert! button to start the conversion. 6. While the files are converted, you can preview the output video file by clicking the red icon at the right part of each conversion line. Once the conversion is done, the converted video files will be at the output directory you specified at step 3. You can open that directory by clicking the Open Directory button at the bottom pane. 75 User Guide 74 Converting To RMVB Format In order to convert your video file to RMVB video format, follow these steps: 1. Press the To RMVB button at the top formats menu. If there is a choice of a specific format, please choose one (in example, RMVB or RMVB HD). The output format you ve chosen should be now marked in yellow. 2. Click the Add Files button at the right pane, and choose file(s) for conversion. 3. At the bottom right, click the Browse button to choose the output directory. This will be the directory where the converted files will be written to. 4. If you wish to set custom (advanced) settings, click the Advanced >> button to open the right advanced properties pane. 76 User Guide 75 In the right advanced properties pane you can modify some of the following properties, which will affect the conversion process: Video Properties o Video Codec The video codec which will be used to convert the video file. You can choose from variety of codecs which are supported for your chosen output video format. More information about video codecs at Wikipedia In case you aren t sure which codec to use, you can choose the Auto option. o Video Size You can specify a custom size for the output video file (width and height). You can choose the Auto option if you do not know which video size you wish to get, or if you would like to try and output the video file at the same size as the original video file. o Video Bitrate The higher the bit rate will be, the higher the video quality will be at the result video file. Increasing it will also result in an increased file size and higher conversion time. 78 User Guide 77 can specify the Starting Time as 00:01:00, and duration as 00:04:00 to convert 4 minutes, starting from the first minute of the video file. Special o Split This feature allows you to split the video file to equal sized chunks of video. This is used commonly used to squeeze video files into media such as floppies, CD, RMVB and more. 5. Now, click the Convert! button to start the conversion. 6. While the files are converted, you can preview the output video file by clicking the red icon at the right part of each conversion line. Once the conversion is done, the converted video files will be at the output directory you specified at step 3. You can open that directory by clicking the Open Directory button at the bottom pane. 79 User Guide 78 Converting To DV Format In order to convert your video file to DV video format, follow these steps: 1. Press the To DV button at the top formats menu. If there is a choice of a specific format, please choose one (in example, DV or DV HD). The output format you ve chosen should be now marked in yellow. 2. Click the Add Files button at the right pane, and choose file(s) for conversion. 3. At the bottom right, click the Browse button to choose the output directory. This will be the directory where the converted files will be written to. 4. If you wish to set custom (advanced) settings, click the Advanced >> button to open the right advanced properties pane. 80 User Guide 79 In the right advanced properties pane you can modify some of the following properties, which will affect the conversion process: Video Properties o Video Codec The video codec which will be used to convert the video file. You can choose from variety of codecs which are supported for your chosen output video format. More information about video codecs at Wikipedia In case you aren t sure which codec to use, you can choose the Auto option. o Video Size You can specify a custom size for the output video file (width and height). You can choose the Auto option if you do not know which video size you wish to get, or if you would like to try and output the video file at the same size as the original video file. o Video Bitrate The higher the bit rate will be, the higher the video quality will be at the result video file. Increasing it will also result in an increased file size and higher conversion time. 82 User Guide 81 can specify the Starting Time as 00:01:00, and duration as 00:04:00 to convert 4 minutes, starting from the first minute of the video file. Special o Split This feature allows you to split the video file to equal sized chunks of video. This is used commonly used to squeeze video files into media such as floppies, CD, DV and more. 5. Now, click the Convert! button to start the conversion. 6. While the files are converted, you can preview the output video file by clicking the red icon at the right part of each conversion line. Once the conversion is done, the converted video files will be at the output directory you specified at step 3. You can open that directory by clicking the Open Directory button at the bottom pane. 83 User Guide 82 Converting To ASF Format In order to convert your video file to ASF video format, follow these steps: 1. Press the To ASF button at the top formats menu. If there is a choice of a specific format, please choose one (in example, ASF or ASF HD). The output format you ve chosen should be now marked in yellow. 2. Click the Add Files button at the right pane, and choose file(s) for conversion. 3. At the bottom right, click the Browse button to choose the output directory. This will be the directory where the converted files will be written to. 4. If you wish to set custom (advanced) settings, click the Advanced >> button to open the right advanced properties pane. 84 User Guide 83 In the right advanced properties pane you can modify some of the following properties, which will affect the conversion process: Video Properties o Video Codec The video codec which will be used to convert the video file. You can choose from variety of codecs which are supported for your chosen output video format. More information about video codecs at Wikipedia In case you aren t sure which codec to use, you can choose the Auto option. o Video Size You can specify a custom size for the output video file (width and height). You can choose the Auto option if you do not know which video size you wish to get, or if you would like to try and output the video file at the same size as the original video file. o Video Bitrate The higher the bit rate will be, the higher the video quality will be at the result video file. Increasing it will also result in an increased file size and higher conversion time. 86 User Guide 85 can specify the Starting Time as 00:01:00, and duration as 00:04:00 to convert 4 minutes, starting from the first minute of the video file. Special o Split This feature allows you to split the video file to equal sized chunks of video. This is used commonly used to squeeze video files into media such as floppies, CD, ASF and more. 5. Now, click the Convert! button to start the conversion. 6. While the files are converted, you can preview the output video file by clicking the red icon at the right part of each conversion line. Once the conversion is done, the converted video files will be at the output directory you specified at step 3. You can open that directory by clicking the Open Directory button at the bottom pane. 87 User Guide 86 Converting To Audio Formats Dozens of audio file formats are supported both for input and output in VIP Video Converter. The supported file formats include: MP3, WMA, OGG, WAV, AAC, AC3, MP2, AIFF, FLAC, AU, AMR, RA. Converting To MP3 Format In order to convert your video file to MP3 video format, follow these steps: 1. Press the To MP3 button at the top formats menu. If there is a choice of a specific format, please choose one (in example, MP3 or MP3 HD). The output format you ve chosen should be now marked in yellow. 2. Click the Add Files button at the right pane, and choose file(s) for conversion. 88 User Guide At the bottom right, click the Browse button to choose the output directory. This will be the directory where the converted files will be written to. 4. If you wish to set custom (advanced) settings, click the Advanced >> button to open the right advanced properties pane. In the right advanced properties pane you can modify some of the following properties, which will affect the conversion process: Video Properties o Video Codec The video codec which will be used to convert the video file. You can choose from variety of codecs which are supported for your chosen output video format. More information about video codecs at Wikipedia In case you aren t sure which codec to use, you can choose the Auto option. 89 User Guide 88 o Video Size You can specify a custom size for the output video file (width and height). You can choose the Auto option if you do not know which video size you wish to get, or if you would like to try and output the video file at the same size as the original video file. o Video Bitrate The higher the bit rate will be, the higher the video quality will be at the result video file. Increasing it will also result in an increased file size and higher conversion time. o Frame Rate Frames which will be shown per second. Increasing it will also result in an increased file size and higher conversion time. o Aspect Ratio The ratio between width and height. Common values are 16:9 or 4:3. The Auto option can be selected when the original aspect ratio is to be kept. 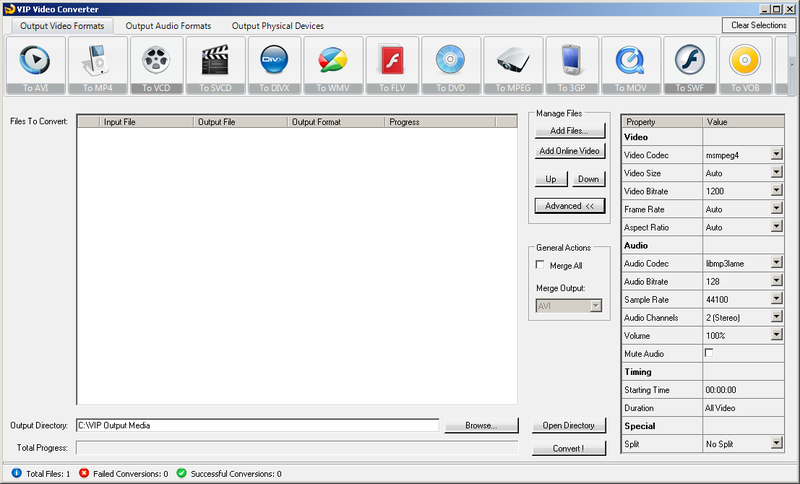 Audio Properties o Audio Codec - The audio codec which will be used to convert the audio layer of the video file. You can choose from variety of codecs which are supported for your chosen output format. More information about audio codecs at Wikipedia. In case you aren t sure which codec to use, you can choose the Auto option. o Audio Bitrate - The higher the bit rate will be, the higher the audio quality will be at the result video file. Increasing it will also result in an increased file size and higher conversion time. o Sample Rate Amount of samples used to create an audio signal. Increasing it will also result in an increased file size and higher conversion time. o Audio Channels The number of audio channels used for the audio layer. Common values are 1 channel (mono), 2 channels (stereo), or 5.1 (6 channels). o Volume Set the percentage of the audio volume which will be available at the converted video file. This is relative to the original video file. o Mute Audio This option allows you to mute the audio in the converted video file. 90 User Guide 89 Timing o Starting Time This option allows you to start the conversion at a specific location (time) in the video file, and not from the beginning. o Duration This option allows you to specify a specific duration from the video file which will be converted. This option actually also acts as an end time, when combined with the Starting Time option. In example, you can specify the Starting Time as 00:01:00, and duration as 00:04:00 to convert 4 minutes, starting from the first minute of the video file. Special o Split This feature allows you to split the video file to equal sized chunks of video. This is used commonly used to squeeze video files into media such as floppies, CD, DVD and more. 5. Now, click the Convert! button to start the conversion. 6. While the files are converted, you can preview the output video file by clicking the red icon at the right part of each conversion line. Once the conversion is done, the converted video files will be at the output directory you specified at step 3. You can open that directory by clicking the Open Directory button at the bottom pane. 91 User Guide 90 Converting To WMA Format In order to convert your video file to WMA video format, follow these steps: 1. Press the To WMA button at the top formats menu. If there is a choice of a specific format, please choose one (in example, WMA or WMA HD). The output format you ve chosen should be now marked in yellow. 2. Click the Add Files button at the right pane, and choose file(s) for conversion. 3. At the bottom right, click the Browse button to choose the output directory. This will be the directory where the converted files will be written to. 4. If you wish to set custom (advanced) settings, click the Advanced >> button to open the right advanced properties pane. 92 User Guide 91 In the right advanced properties pane you can modify some of the following properties, which will affect the conversion process: Video Properties o Video Codec The video codec which will be used to convert the video file. You can choose from variety of codecs which are supported for your chosen output video format. More information about video codecs at Wikipedia In case you aren t sure which codec to use, you can choose the Auto option. o Video Size You can specify a custom size for the output video file (width and height). You can choose the Auto option if you do not know which video size you wish to get, or if you would like to try and output the video file at the same size as the original video file. o Video Bitrate The higher the bit rate will be, the higher the video quality will be at the result video file. Increasing it will also result in an increased file size and higher conversion time. 94 User Guide 93 can specify the Starting Time as 00:01:00, and duration as 00:04:00 to convert 4 minutes, starting from the first minute of the video file. Special o Split This feature allows you to split the video file to equal sized chunks of video. This is used commonly used to squeeze video files into media such as floppies, CD, DVD and more. 5. Now, click the Convert! button to start the conversion. 6. While the files are converted, you can preview the output video file by clicking the red icon at the right part of each conversion line. Once the conversion is done, the converted video files will be at the output directory you specified at step 3. You can open that directory by clicking the Open Directory button at the bottom pane. 95 User Guide 94 Converting To OGG Format In order to convert your video file to OGG video format, follow these steps: 1. Press the To OGG button at the top formats menu. If there is a choice of a specific format, please choose one (in example, OGG or OGG HD). The output format you ve chosen should be now marked in yellow. 2. Click the Add Files button at the right pane, and choose file(s) for conversion. 3. At the bottom right, click the Browse button to choose the output directory. This will be the directory where the converted files will be written to. 4. If you wish to set custom (advanced) settings, click the Advanced >> button to open the right advanced properties pane. 96 User Guide 95 In the right advanced properties pane you can modify some of the following properties, which will affect the conversion process: Video Properties o Video Codec The video codec which will be used to convert the video file. You can choose from variety of codecs which are supported for your chosen output video format. More information about video codecs at Wikipedia In case you aren t sure which codec to use, you can choose the Auto option. o Video Size You can specify a custom size for the output video file (width and height). You can choose the Auto option if you do not know which video size you wish to get, or if you would like to try and output the video file at the same size as the original video file. o Video Bitrate The higher the bit rate will be, the higher the video quality will be at the result video file. Increasing it will also result in an increased file size and higher conversion time. 98 User Guide 97 can specify the Starting Time as 00:01:00, and duration as 00:04:00 to convert 4 minutes, starting from the first minute of the video file. Special o Split This feature allows you to split the video file to equal sized chunks of video. This is used commonly used to squeeze video files into media such as floppies, CD, DVD and more. 5. Now, click the Convert! button to start the conversion. 6. While the files are converted, you can preview the output video file by clicking the red icon at the right part of each conversion line. Once the conversion is done, the converted video files will be at the output directory you specified at step 3. You can open that directory by clicking the Open Directory button at the bottom pane. 99 User Guide 98 Converting To WAV Format In order to convert your video file to WAV video format, follow these steps: 1. Press the To WAV button at the top formats menu. If there is a choice of a specific format, please choose one (in example, WAV or WAV HD). The output format you ve chosen should be now marked in yellow. 2. Click the Add Files button at the right pane, and choose file(s) for conversion. 3. At the bottom right, click the Browse button to choose the output directory. This will be the directory where the converted files will be written to. 4. If you wish to set custom (advanced) settings, click the Advanced >> button to open the right advanced properties pane. 100 User Guide 99 In the right advanced properties pane you can modify some of the following properties, which will affect the conversion process: Video Properties o Video Codec The video codec which will be used to convert the video file. You can choose from variety of codecs which are supported for your chosen output video format. More information about video codecs at Wikipedia In case you aren t sure which codec to use, you can choose the Auto option. o Video Size You can specify a custom size for the output video file (width and height). You can choose the Auto option if you do not know which video size you wish to get, or if you would like to try and output the video file at the same size as the original video file. o Video Bitrate The higher the bit rate will be, the higher the video quality will be at the result video file. Increasing it will also result in an increased file size and higher conversion time. 102 User Guide 101 can specify the Starting Time as 00:01:00, and duration as 00:04:00 to convert 4 minutes, starting from the first minute of the video file. Special o Split This feature allows you to split the video file to equal sized chunks of video. This is used commonly used to squeeze video files into media such as floppies, CD, DVD and more. 5. Now, click the Convert! button to start the conversion. 6. While the files are converted, you can preview the output video file by clicking the red icon at the right part of each conversion line. Once the conversion is done, the converted video files will be at the output directory you specified at step 3. You can open that directory by clicking the Open Directory button at the bottom pane. 103 User Guide 102 Converting To AAC Format In order to convert your video file to AAC video format, follow these steps: 1. Press the To AAC button at the top formats menu. If there is a choice of a specific format, please choose one (in example, AAC or AAC HD). The output format you ve chosen should be now marked in yellow. 2. Click the Add Files button at the right pane, and choose file(s) for conversion. 3. At the bottom right, click the Browse button to choose the output directory. This will be the directory where the converted files will be written to. 4. If you wish to set custom (advanced) settings, click the Advanced >> button to open the right advanced properties pane. 104 User Guide 103 In the right advanced properties pane you can modify some of the following properties, which will affect the conversion process: Video Properties o Video Codec The video codec which will be used to convert the video file. You can choose from variety of codecs which are supported for your chosen output video format. More information about video codecs at Wikipedia In case you aren t sure which codec to use, you can choose the Auto option. o Video Size You can specify a custom size for the output video file (width and height). You can choose the Auto option if you do not know which video size you wish to get, or if you would like to try and output the video file at the same size as the original video file. o Video Bitrate The higher the bit rate will be, the higher the video quality will be at the result video file. Increasing it will also result in an increased file size and higher conversion time. 106 User Guide 105 can specify the Starting Time as 00:01:00, and duration as 00:04:00 to convert 4 minutes, starting from the first minute of the video file. Special o Split This feature allows you to split the video file to equal sized chunks of video. This is used commonly used to squeeze video files into media such as floppies, CD, DVD and more. 5. Now, click the Convert! button to start the conversion. 6. While the files are converted, you can preview the output video file by clicking the red icon at the right part of each conversion line. Once the conversion is done, the converted video files will be at the output directory you specified at step 3. You can open that directory by clicking the Open Directory button at the bottom pane. 107 User Guide 106 Converting To MP2 Format In order to convert your video file to MP2 video format, follow these steps: 1. Press the To MP2 button at the top formats menu. If there is a choice of a specific format, please choose one (in example, MP2 or MP2 HD). The output format you ve chosen should be now marked in yellow. 2. Click the Add Files button at the right pane, and choose file(s) for conversion. 3. At the bottom right, click the Browse button to choose the output directory. This will be the directory where the converted files will be written to. 4. If you wish to set custom (advanced) settings, click the Advanced >> button to open the right advanced properties pane. 108 User Guide 107 In the right advanced properties pane you can modify some of the following properties, which will affect the conversion process: Video Properties o Video Codec The video codec which will be used to convert the video file. You can choose from variety of codecs which are supported for your chosen output video format. More information about video codecs at Wikipedia In case you aren t sure which codec to use, you can choose the Auto option. o Video Size You can specify a custom size for the output video file (width and height). You can choose the Auto option if you do not know which video size you wish to get, or if you would like to try and output the video file at the same size as the original video file. o Video Bitrate The higher the bit rate will be, the higher the video quality will be at the result video file. Increasing it will also result in an increased file size and higher conversion time. 110 User Guide 109 can specify the Starting Time as 00:01:00, and duration as 00:04:00 to convert 4 minutes, starting from the first minute of the video file. Special o Split This feature allows you to split the video file to equal sized chunks of video. This is used commonly used to squeeze video files into media such as floppies, CD, DVD and more. 5. Now, click the Convert! button to start the conversion. 6. While the files are converted, you can preview the output video file by clicking the red icon at the right part of each conversion line. Once the conversion is done, the converted video files will be at the output directory you specified at step 3. You can open that directory by clicking the Open Directory button at the bottom pane. 111 User Guide 110 Converting To AIFF Format In order to convert your video file to AIFF video format, follow these steps: 1. Press the To AIFF button at the top formats menu. If there is a choice of a specific format, please choose one (in example, AIFF or AIFF HD). The output format you ve chosen should be now marked in yellow. 2. Click the Add Files button at the right pane, and choose file(s) for conversion. 3. At the bottom right, click the Browse button to choose the output directory. This will be the directory where the converted files will be written to. 4. If you wish to set custom (advanced) settings, click the Advanced >> button to open the right advanced properties pane. 112 User Guide 111 In the right advanced properties pane you can modify some of the following properties, which will affect the conversion process: Video Properties o Video Codec The video codec which will be used to convert the video file. You can choose from variety of codecs which are supported for your chosen output video format. More information about video codecs at Wikipedia In case you aren t sure which codec to use, you can choose the Auto option. o Video Size You can specify a custom size for the output video file (width and height). You can choose the Auto option if you do not know which video size you wish to get, or if you would like to try and output the video file at the same size as the original video file. o Video Bitrate The higher the bit rate will be, the higher the video quality will be at the result video file. Increasing it will also result in an increased file size and higher conversion time. 114 User Guide 113 can specify the Starting Time as 00:01:00, and duration as 00:04:00 to convert 4 minutes, starting from the first minute of the video file. Special o Split This feature allows you to split the video file to equal sized chunks of video. This is used commonly used to squeeze video files into media such as floppies, CD, DVD and more. 5. Now, click the Convert! button to start the conversion. 6. While the files are converted, you can preview the output video file by clicking the red icon at the right part of each conversion line. Once the conversion is done, the converted video files will be at the output directory you specified at step 3. You can open that directory by clicking the Open Directory button at the bottom pane. 115 User Guide 114 Converting To FLAC Format In order to convert your video file to FLAC video format, follow these steps: 1. Press the To FLAC button at the top formats menu. If there is a choice of a specific format, please choose one (in example, FLAC or FLAC HD). The output format you ve chosen should be now marked in yellow. 2. Click the Add Files button at the right pane, and choose file(s) for conversion. 3. At the bottom right, click the Browse button to choose the output directory. This will be the directory where the converted files will be written to. 4. If you wish to set custom (advanced) settings, click the Advanced >> button to open the right advanced properties pane. 116 User Guide 115 In the right advanced properties pane you can modify some of the following properties, which will affect the conversion process: Video Properties o Video Codec The video codec which will be used to convert the video file. You can choose from variety of codecs which are supported for your chosen output video format. More information about video codecs at Wikipedia In case you aren t sure which codec to use, you can choose the Auto option. o Video Size You can specify a custom size for the output video file (width and height). You can choose the Auto option if you do not know which video size you wish to get, or if you would like to try and output the video file at the same size as the original video file. o Video Bitrate The higher the bit rate will be, the higher the video quality will be at the result video file. Increasing it will also result in an increased file size and higher conversion time. 118 User Guide 117 can specify the Starting Time as 00:01:00, and duration as 00:04:00 to convert 4 minutes, starting from the first minute of the video file. Special o Split This feature allows you to split the video file to equal sized chunks of video. This is used commonly used to squeeze video files into media such as floppies, CD, DVD and more. 5. Now, click the Convert! button to start the conversion. 6. While the files are converted, you can preview the output video file by clicking the red icon at the right part of each conversion line. Once the conversion is done, the converted video files will be at the output directory you specified at step 3. You can open that directory by clicking the Open Directory button at the bottom pane. 119 User Guide 118 Converting To RA Format In order to convert your video file to RA video format, follow these steps: 1. Press the To RA button at the top formats menu. If there is a choice of a specific format, please choose one (in example, RA or RA HD). The output format you ve chosen should be now marked in yellow. 2. Click the Add Files button at the right pane, and choose file(s) for conversion. 3. At the bottom right, click the Browse button to choose the output directory. This will be the directory where the converted files will be written to. 4. If you wish to set custom (advanced) settings, click the Advanced >> button to open the right advanced properties pane. 120 User Guide 119 In the right advanced properties pane you can modify some of the following properties, which will affect the conversion process: Video Properties o Video Codec The video codec which will be used to convert the video file. You can choose from variety of codecs which are supported for your chosen output video format. More information about video codecs at Wikipedia In case you aren t sure which codec to use, you can choose the Auto option. o Video Size You can specify a custom size for the output video file (width and height). You can choose the Auto option if you do not know which video size you wish to get, or if you would like to try and output the video file at the same size as the original video file. o Video Bitrate The higher the bit rate will be, the higher the video quality will be at the result video file. Increasing it will also result in an increased file size and higher conversion time. 122 User Guide 121 can specify the Starting Time as 00:01:00, and duration as 00:04:00 to convert 4 minutes, starting from the first minute of the video file. Special o Split This feature allows you to split the video file to equal sized chunks of video. This is used commonly used to squeeze video files into media such as floppies, CD, DVD and more. 5. Now, click the Convert! button to start the conversion. 6. While the files are converted, you can preview the output video file by clicking the red icon at the right part of each conversion line. Once the conversion is done, the converted video files will be at the output directory you specified at step 3. You can open that directory by clicking the Open Directory button at the bottom pane. Preview / Player pane This is where you can view your videos and photos listen to audio and watch your finished movie. Copyright 2002-2003 Kinoma Inc. All rights reserved. Contents Chapter 1: Product Overview... 3 1.1 Product Features... 3 Chapter 2 Installation... 3 2.1 System Requirements... 3 2. Super-Fast Guide to Audio Editing Audacity is a free, totally free, audio editing program. Get it here: http://audacity.sourceforge.net/ Installing Audacity 1. Download Audacity to your own computer. 2. Frequently Asked Questions ESP. My ESP is getting slower and freezes. What is happening? User Manual Any company, product or service names found in this document may be the trademarks or registered trademarks of their respective companies. BSR SCREEN RECORDER Version 5.1 USER MANUAL Copyright 2000 2011 BSRSoft TABLE OF CONTENTS 1.... 1 2. MAIN INTERFACE... 2 2.1. Video Source Selection... 2 2.2. WatchIt Mode... 3 2.3. Open Wizard... 3 2.4.